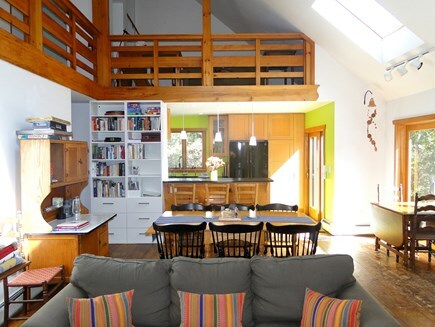 This beautiful 3 bedroom plus loft home, minutes from the central northeast coast of Martha's Vineyard, is airy and sunlit with wood and tile floors, custom woodwork, cathedral ceilings, skylights, deck and screened porch. Membership in neighborhood pool association included. Ferry tickets available at cost. Linens and towels available ($150). We are located in Stoney Hill Farms, a quiet, rural neighborhood near Lambert's Cove. Just open the rear porch door and a few steps will take you into the State Forest's lush vegetation. 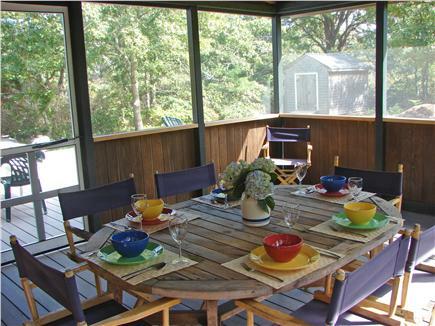 Or just sit on the rear deck and enjoy a back yard barbeque. Additional pricing info: $100/week discount for multi-weeks. $150 cleaning fee. $250 refundable security. $150 optional linen, State and local taxes of 5.7% will apply. 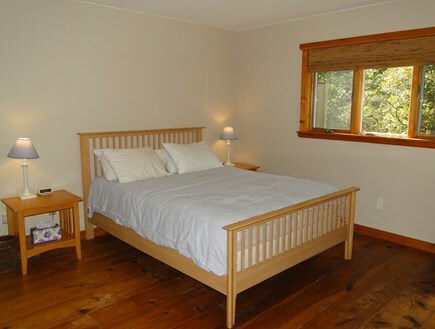 First floor bedroom and bath with handicap fixtures. Note: entrance to the house requires ascending 3 steps to the deck. We have been renting for almost 10 years, great family vacation home. Terrific for beach, biking,fishing and all things vacation. Well equipped with fabulous porch and outdoor shower. We loved this house and will definitely consider it again if we come back with the same number of people. We were there during a heat wave, and although there are fans (in fact, we didn't have enough and William said to purchase whatever we needed to feel comfortable and he would reimburse me, which he did immediately), there is not air conditioning. This was fine for me and for my kids, but my 76 year old mother had a very hard time with the heat. She was able to cool off in the pool, which made a huge difference. The location is amazing, the pool was a great perk, the set up of the house is excellent and it was the most well stocked house in terms of cooking utensils, Tupperware, sheets, towels, beach chairs, umbrellas, that I have ever rented. William was responsive to all of our needs and questions within minutes. The house is clean and very comfortable. We really loved it, and William was the best host I have ever dealt with on VRBO, and we have rented many many times all over the world. We are already trying to figure out how many people we will have for next summer so we can make sure to reserve this house if we will fit. A wonderful vacation overall. 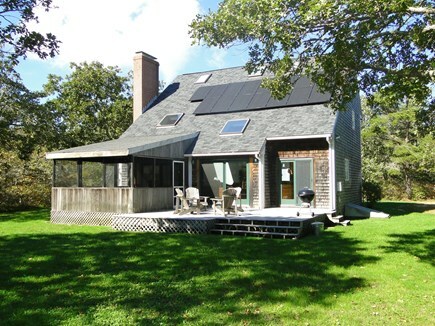 We are enjoying our second stay at this attractive and so functional house in a quiet West Tisbury neighborhhood. The four of us including two young teens have plenty of spaces, indoors and outside, to be together or to get some alone time. We love having access to the pool across the street from the house and the pingpong table in the basement. We again found ourselves eating more at the house because the well equipped kitchen made food prep a breeze. This house was nicer than expected. Very comfortable, equipped with everything one might need. Lovely property on a quiet street,a joy to return to after a busy day. We had a very relaxing two weeks and are considering going back again next year. If you are looking for a great vacation spot, we would highly recommend this property. Getting the parking pass to Lambert"s Cove Beach was great - it is an amazing place, loved it!!! We had a wonderful time staying in this lovely and comfortable home! The property is so tranquil and serene. The home offers the perfect combination of 'rustic Vineyard' and modern amenities, with its wide pine floors, vaulted ceilings and contemporary (and well stocked) kitchen. We truly had a spectacular vacation and plan to come back next summer! 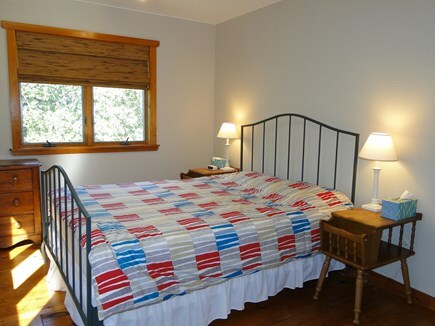 The house is lovely, Lambert's Cove beach is great, and the nearby swimming pool is large and well maintained. But what really makes this place is how welcoming it is. No running out to buy TP or salt and pepper--the house is nicely stocked and everything is well explained. Highly professional and courteous. And spend plenty of time in the hammock. My family (2+3 kids) passed a fantastic July 4th week at his wonderful house. Rarely have we rented anywhere that was so thoroughly equipped. We brought along the usual basics that you think you will need and never even had to unpack them! The kitchen is especially well stocked down to washing up products, bags etc. The house was spotless, in a beautiful, secluded location with tennis courts and pool but centrally placed to make any day trip easy. We truly loved this house! The pictures do not do it justice, as it is wonderfully big, airy and beautifully decorated. 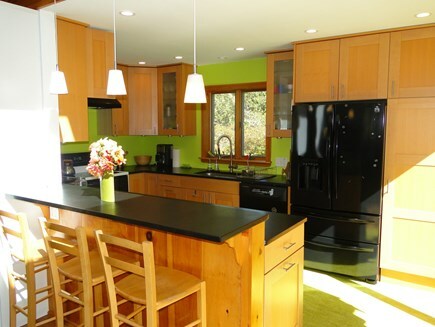 The kitchen is modern and luxurious, and the house has every item you could need. The outside space is great for playing ball or just relaxing. We loved this house and had a wonderful vacation enjoying it! This is our third year staying at this clean, serene home. With 3 young children, the house is in a perfect location. 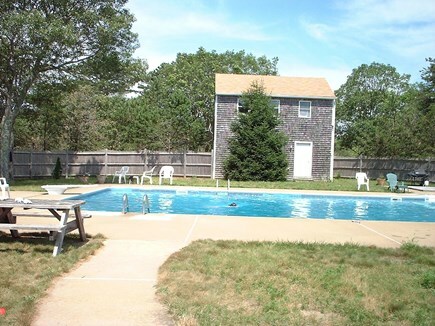 There is a pool across the street and beautiful Lambert's Cove a 10 minute drive. Close enough to shopping, but away from the crowds. 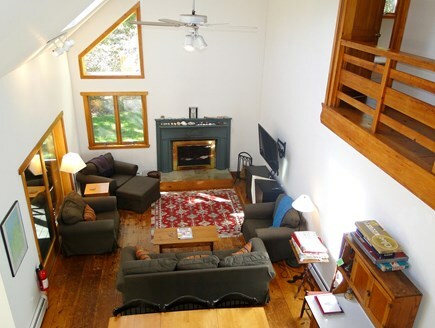 The home itself has a beautiful screened porch, a barbecue, and outdoor shower and hammock. Everything we needed for a relaxing vacation! Will and Kim Messenger live in the Boston area. Kim fell in love with Martha's Vineyard as a child during family vacations and summer camp there. When she met Will, she introduced him to the Island, and they began to plan a way to have a summer home there and share it with others. They bought this home on Stoney Hill Lane from the builder in 1994 and have been using it and offering it to renters ever since. Their two daughters grew up loving the house. One was even born on Martha's Vineyard while they lived there in the off-season. All of them say it's their favorite place in the world. Both Will and Kim work in the non-profit world, and renting the house for vacationers makes it possible for them to keep it in top condition and share the Island experience with others. You will feel at home the moment you walk in. 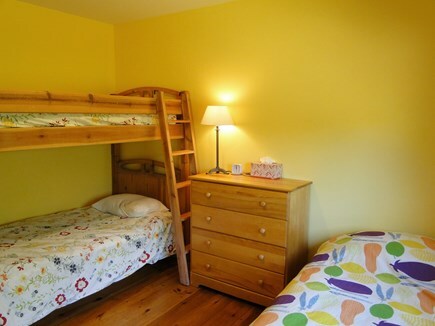 For over twenty years, our guests always tell us they feel comfortable, safe, and care-free. We keep everything in top condition, and at the same time it feels comfortable and relaxed. We're fortunate that the builder created an open, easy floor plan and completed it with beautiful, yet sturdy, finishes and details. It's bright, sunny, breezy (if you open the windows), uncluttered, and quiet. It has all the amenities people ask about, except air conditioning. We realized that air conditioning creates and inside and an outside. When it's is on, you close the windows and doors and shut yourself in. 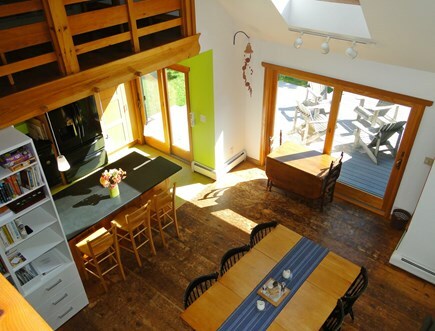 We want just the opposite--a home that opens to the outdoors. So we decided not to have air conditioning. You can see from the reviews that people always love staying here. The most common thing we hear is, ''It's better than I expected!'' Maybe the website doesn't quite do it justice. Still, we're happy it beats expectations. Maybe it's because of the love we put into it ourselves during the off-season, while keeping everything centered around the best experience for our renters. Some come back for years. West Tisbury is the quiet town in the center of Martha's Vineyard. It's close to the bustling down-island towns and close to the lovely up-island beaches and nature walks. 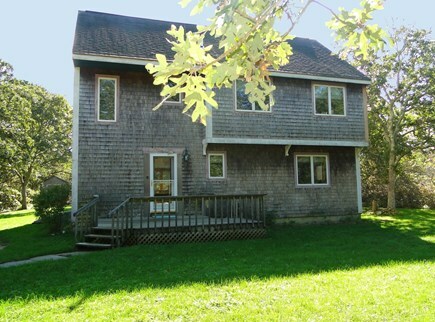 The house comes with a walk-on pass to Lambert's Cove beach, which is only open to West Tisbury residents and renters. (You can buy a car pass for Lambert's Cove by taking your rental agreement to the rec shed to prove you're at WT renter.) Alley's General store is a throwback to old-time, small-town living. Note: If you want step outside and be right among shops, restaurants, harbors, and night spots, this isn't the place for you. Try one of the down-island towns. Ours is a place for quiet and nature right outside your door, with the shops, restaurants, etc., a (short) drive or bike ride away. The house is on a small cul-de-sac with just a few neighbors. The main Island bike path is nearby, along with miles of walking trails right at the end of the lane.